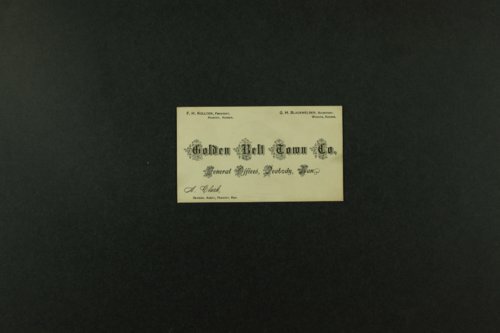 The Golden Belt Town Company was incorporated in 1886. It was chartered to buy and sell land on the right of way of the Chicago, Rock Island and Pacific Railway in south-central Kansas, including the communities of Waldeck, Durham, Tampa, Ramona, Lincolnville, Furley, and Peck. The company also owned an undivided one-half interest in the Lost Springs, Aulne, Elbing, Whitewater, and Gladys townsites. Mr. F. H. Kollock of Peabody, Kansas, was named president and served until his death in 1895, at which time Samuel T. Howe assumed the position. G. H. Blackwelder of Wichita was secretary, G. W. Hurd of Abilene was treasurer, and A. Clark of Peabody was general agent. These company records include director's minutes, correspondence, financial statements, land contracts and deeds, and several books containing applications for lots and price lists.